By extensive use of spices I do not mean that spices are used to make the food fiery hot. The spices are used to flavor the food, making each dish distinct and wonderfully aromatic. Each spice by itself imparts a very unique flavor, but when used together with other spices, the combination and permutation of different ones magically change the individual characteristics. Spices are also used for health benefits and medicinal purposes, to prevent diseases and also to preserve food. 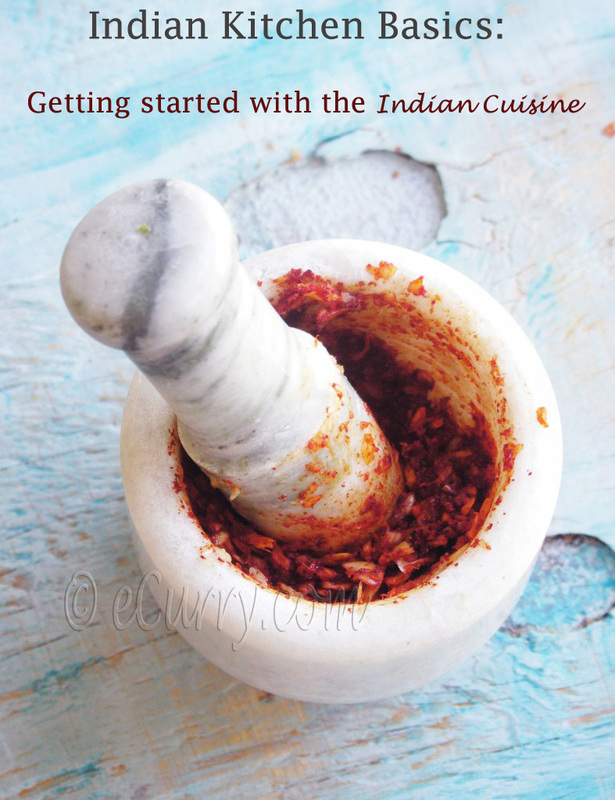 Here I have written about only the few basic spices required to start an Indian spice cabin. There are many more, and some of them might be used only sparingly. I will add them slowly as and when required. I must mention here that the spices are also region specific; some spices which may be very popular in the northern regions of India might not be used as much in the southern regions and vice versa. What we have here is a general spread, used by all in every state. Well almost! These spices below should be readily available in most grocery stores, or Whole Food stores, except for the Hing/Asafoetida, Fennel and the Fenugreek seeds. If you do not find them at your local grocery store, look for a local Indian/Bangladeshi/Pakistani grocery store and they will have it for sure. This is sap from stem and root of a plant, dried into a hard resin. The smell of this spice in the raw uncooked form is strong and pungent; so unpleasant that it is often called as the devils dung, or the stinking gum. However this initial funky pungent smell mellows and almost disappears, replaced by a smooth pleasant flavor when it is added to hot oil or ghee. The flavor is not the spicy fiery kind, but more like Leek or Onion. Hing is definitely a gem in the kitchen. In its raw form, the strong aroma will contaminate other spices, so it is better stored in an air tight container. The resin form is hard and deep amber in color It has to be powdered before it is used for cooking or medicinal purposes. I usually get Hing from India, in the hard resin form as you see above, as it retains the aroma longer than ground powder, and use a mortar and a pestle to grind it as I need it. In Indian grocery stores, the hing is usually found in powdered form. A little goes a long way when it comes to this spice; so only a tiny bit when seasoning and tempering to flavor food. Often mistaken as the Bay Leaf (leaf of the Laurel tree ) used in Western cooking, these are actually three veined leaves of the tree belonging to Cinnamonum group of trees. Tej Patta or Tamalpatra as it is called in Sanskrit are used to flavor different curries and rice. 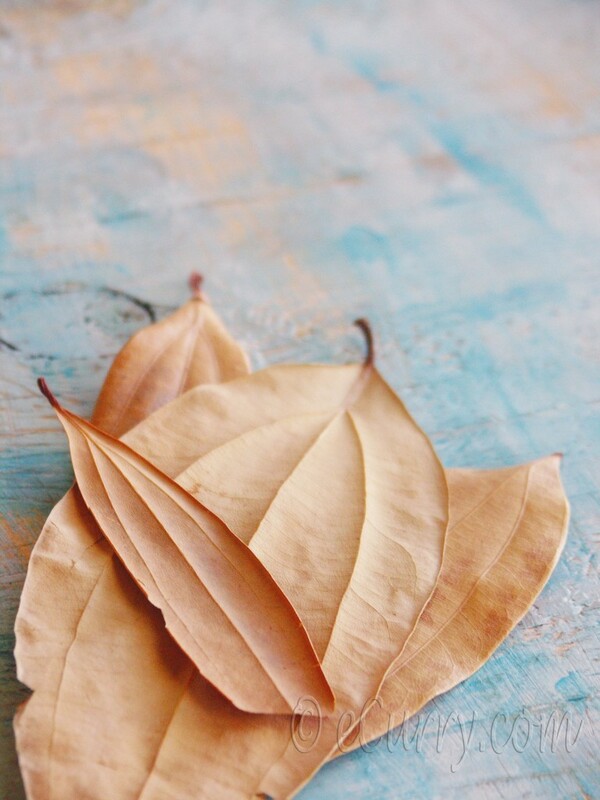 The leaves are aromatic with a slight hint of the fragrance of cinnamon. The leaves are first browned in oil first to increase the aroma. These are pungent, tiny seeds grayish in color and often mistaken to be the “Bishop’s Weed”. 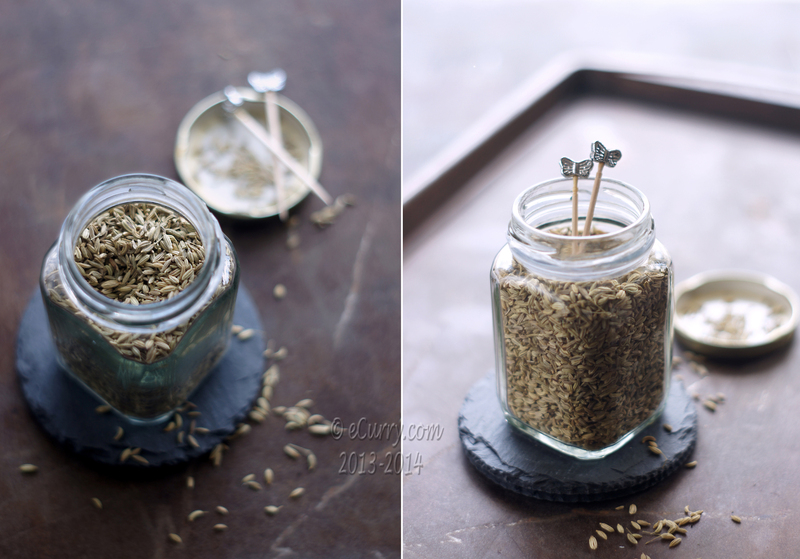 Ajwain has very strong flavors and the smell and the taste bears close similarity to Thyme. They have a sharp and slightly bitter taste on the tongue. In Indian cooking, the Ajwain is rarely used raw. They are usually dry roasted lightly or tempered in hot oil or ghee and used for seasoning a dish. 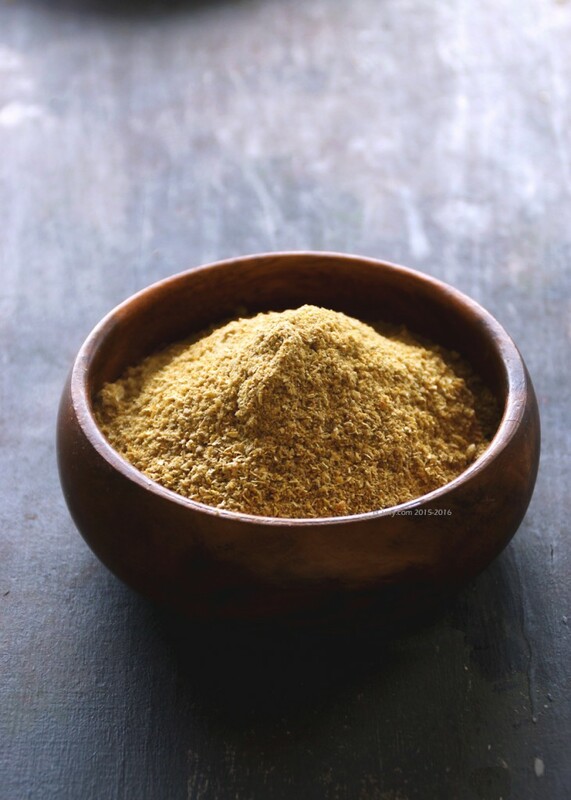 Other than using the seeds for curries, the flavor of this spice works really well with breads and are very popularly used in “Paratha” (griddle fried flatbreads) in the northern regions of the country. Besides culinary uses, it is used for medicinal purposes to aid in digestion and also as an antiseptic. The cinnamon sticks or quills are the dried bark of a tree. 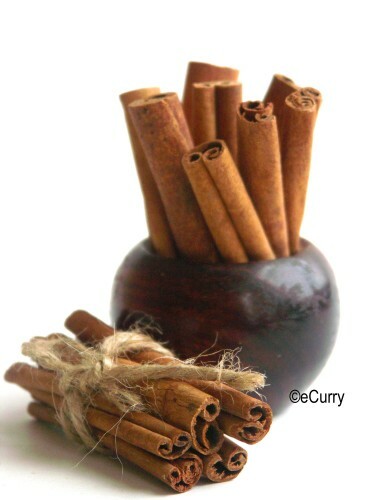 There are two popular varieties of cinnamon; from Chin and from Ceylon. They both have similar flavors but the cinnamon from Ceylon has a sweeter aroma and is found more as sticks than a rolled up quill. The Ceylonese cinnamon is also not so easily available in local markets. Cinnamon (and mostly the Ceylonese variety) in its stick/quill for as well as powdered, is used extensively in Indian cooking, mostly for savory dishes. Often times a few bits of broken sticks are added as the oil heats up; this way the oil is flavored and the food is cooked in this fragrant oil. Sometimes it is dry roasted in a skillet before cooking, which intensifies the aroma. 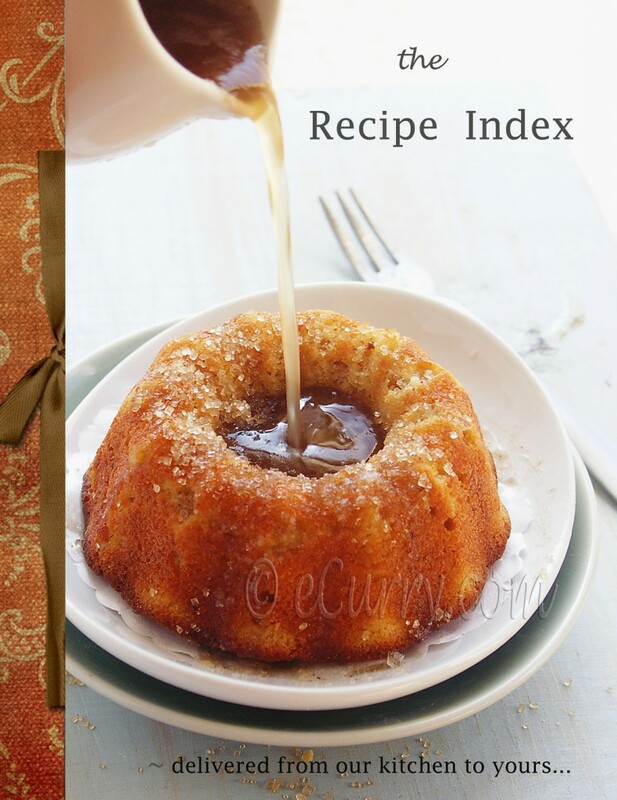 The warm sweet flavors make it a popular spice for desserts in the western world, especially during the holidays. It is one of the ingredients of Garam Masala. Cloves are dried up flower buds. The fully-grown, unopened buds, are picked green and dried in the sun till they become dark brown and are ready to be used for culinary and medicinal purposes. Clove is extensively used in Indian cooking. The flavor it imparts to food is strong and warm. 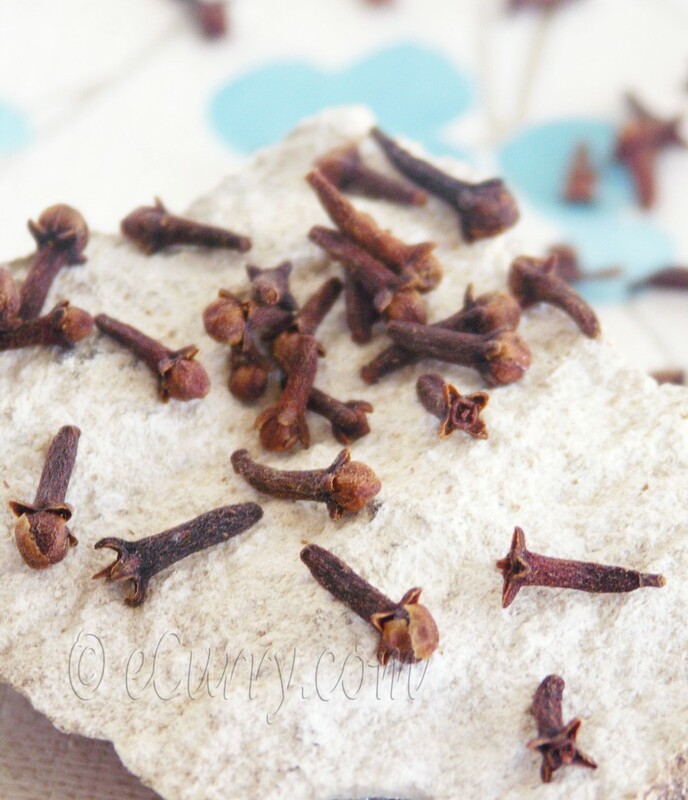 Clove is mostly used to flavor spicy food where the whole clove is cooked in oil or ghee. Clove is also a part of Garam Masala in the ground form. Use of clove in desserts is not very common in India, though not unheard of. 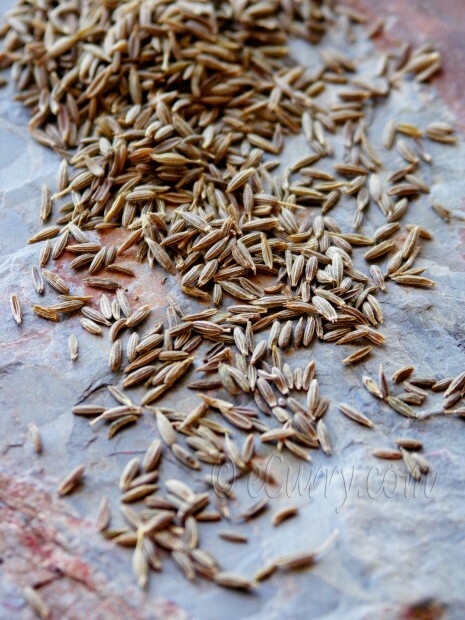 These seeds are the dry seeds of the regularly used fresh cilantro/coriander. Light brown or golden in color, the seeds are kind of hollow and crunchy and has a nice earthy, nutty flavor. The seeds are used whole for tempering, but more often they are ground into a powder to flavor food. Do yourselves a favor and stop yourself from buying store bought coriander powder. They lose the flavor fairly quick when stored, so you will end up with a sawdust kind of powder with no flavor in it. The best way go about it, is to grind the seeds when you use them or store them in an airtight container only for a few days. I use the coffee grinder or the spice grinder to powder the seeds. The seeds are powdered either by roasting them first in a dry skillet or without roasting them. The roasted seeds powdered have a darker shade and a different flavor than the other. Both are used in Indian cuisine. The seeds are usually used in the ground form to be a part of various spice mixes, like Garam Masala, Sambar Powder etc. 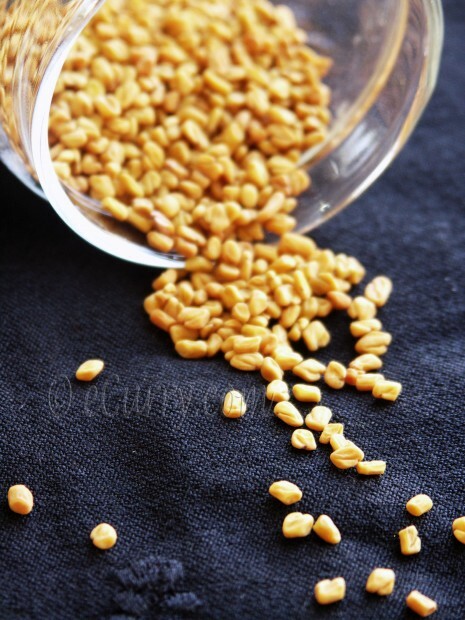 Coriander seeds are ground to make coriander powder. The powder is used in Indian cooking for flavor. Avoid store bought packaged coriander powder. They sit on the shelves too long and lose all its freshness. 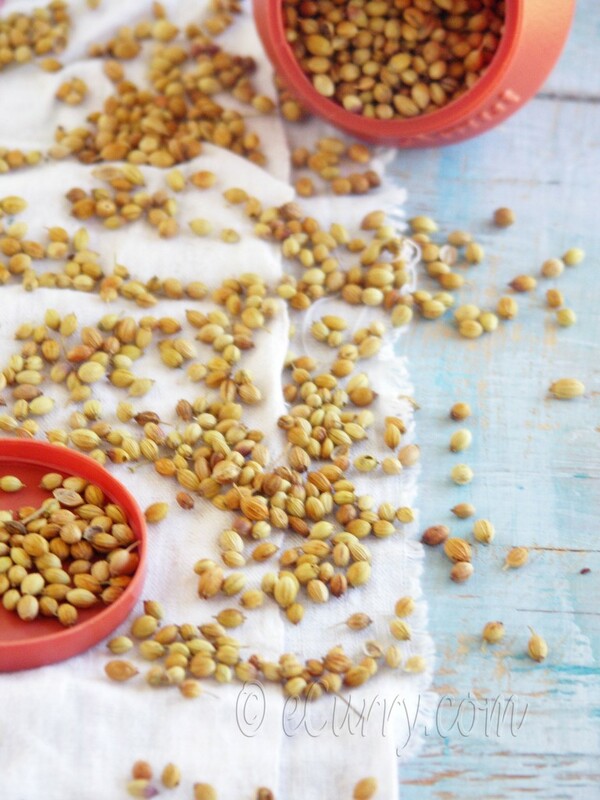 Grind up coriander seeds at home in a spice or coffee grinder and store in airtight containers for a couple of months. 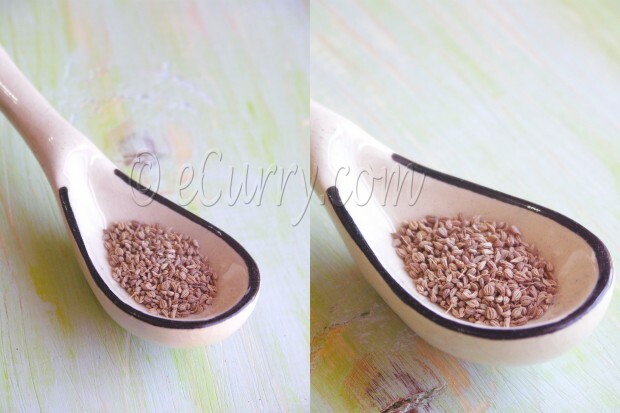 Cumin or Jeera is a very commonly used spice all over India. Known for its warm earthy aroma, it is used in the raw form, or cooked in hot oil or ghee to release its aroma. Sometimes the raw seeds are ground and sometimes the seeds are briefly roasted in the skillet and ground into a powder. The roasted and fried cumin seeds imparts a very unique, smoky flavor to food. Angular buff colored seeds having a slightly bitter taste . One of the mixtures of Panch Foron. The unripe, raw seeds are cooked as side dishes in certain parts of India and they are not bitter. These might look like Cumin Seeds, but when looked closely they are actually greener and wider. 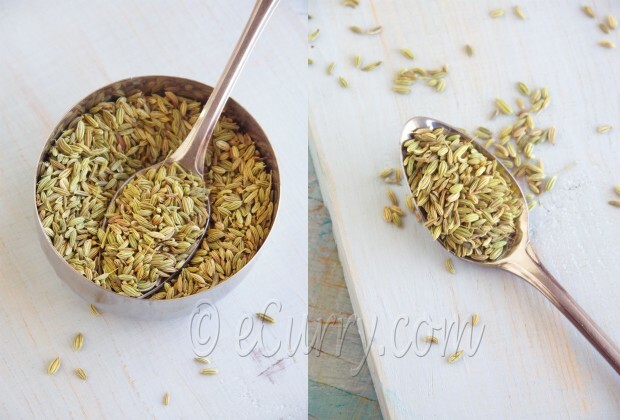 Fennel is another ingredient of the Panch Foron.These are also dry roasted and used with tiny sugar candies to make mouth fresheners after meals. Fennel is known for its digestive qualities. Cardamom pods holds tiny little black seeds inside. The seeds are taken out and used whole in cooking or in the from of powder. Its used in a LOT of Indian cooking whether it be vegetables, meat, rice or even desserts. Cardamom is also an important part of Garam Masala. 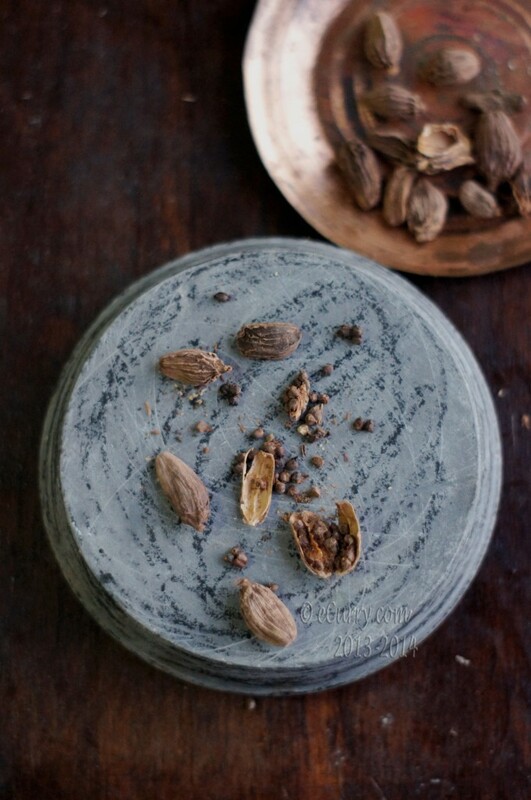 Black cardamom, also known as hill cardamom, Bengal cardamom, greater cardamom, Indian cardamom, Nepal cardamom, winged cardamom, or brown cardamom, comes from either of two species in the family Zingiberaceae (ginger). The seed pods are about 2.5-3 cm in length and have a bold flavor. The pods are dried over open fire and the process leaves the pods with a smoky aroma.These are bigger and very different from the the small green cardamoms, and are not as delicately flavored as their green counterpart. This is probably the reason why these are barely used for flavoring desserts. The intensity of the flavor emerges as they are cooked slowly and for a prolonged period and that is why it is used a lot for braising food, or flavoring the Indian masala (spice) mix for curries, meats or for stews, lentils and pilafs. If you have not tried this before, just try dropping a split pod when you cook your rice and see how it changes the flavor of the rice! A good easy recipe to start with. While there are close to forty kinds of mustard, three principal types used as spices: Black mustard (Brassica nigra), White mustard which are actually yellow (Brassica alba) and brown mustard (dark yellow) (Brassica juncea). 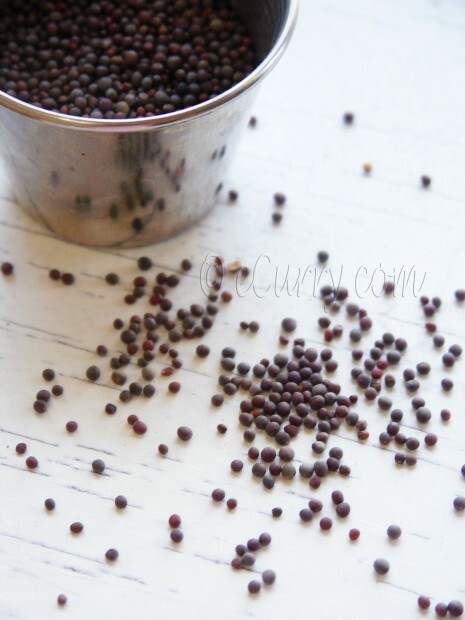 In Indian cooking all three are used, though use of black mustard seeds with stronger flavors is more common. The black mustard seeds have the most pungent taste, followed by the yellow mustard seeds.The white mustard is usually the mildest. 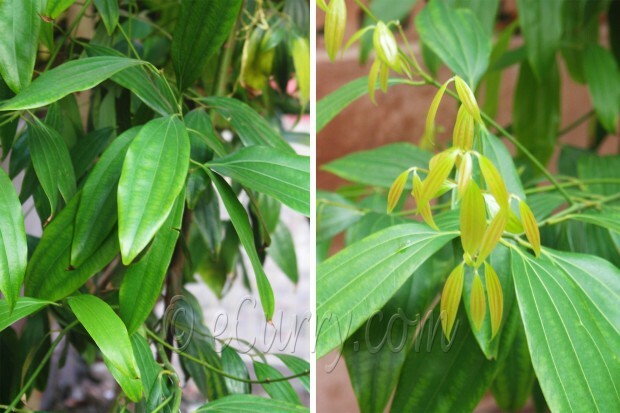 The seeds are usually used to temper/season food by adding them to hot oil. The seeds are also ground to make a paste (usually in the eastern and northern regions of India) and used in cooking fish and vegetables. Mustard paste is used to make many Indian pickles in the northern regions of the country. The oil pressed out from the seeds and commonly sold as mustard oil is used for massage as well as cooking in the northern and eastern regions of India. These are tiny black seeds mostly forming a part of the Panch Foron (recipe below). Nigella is also referred to as Onion Seeds. They are mostly used in breads – like naan, tandoori rotis, parathas, and also sometimes to season stir fries and curries. In the Eastern India this is extensively used to season fish. These are seeds of a fruit. The part that is actually used is the inner part of this seed. Its used in ground form, mostly in biryanis. 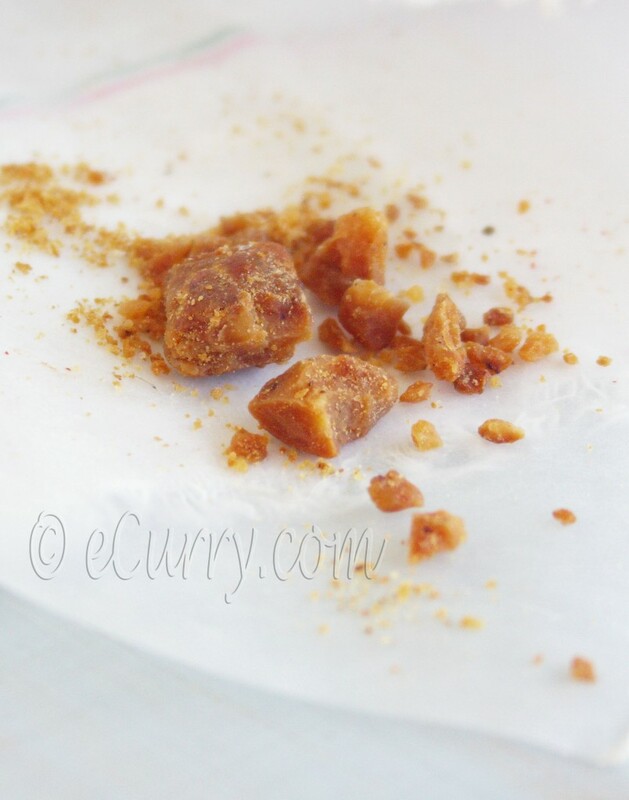 Unlike in western countries, its almost never used in desserts in Indian cooking. This particular spice mix is extensively used in East Indian cooking and also as a pickling spice in most states in India. This is ground up dried red chili peppers (as shown below). There are different varieties of Chili Powder available in the Indian groceries. They are made from different kind of peppers with different colors, aroma and also the spice/heat level. The Kashmiri Chili Red Chili Powder is a mild chili powder but with very vibrant colors and this is what I usually use in my kitchen. 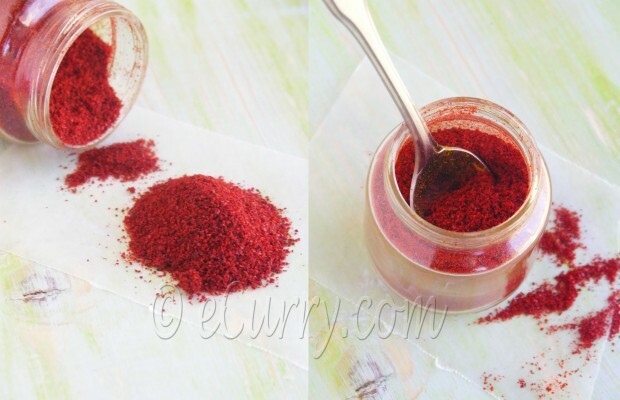 Another one which I like to use is the Reshmapati Red Chilli Powder; this one has a beautiful color too. 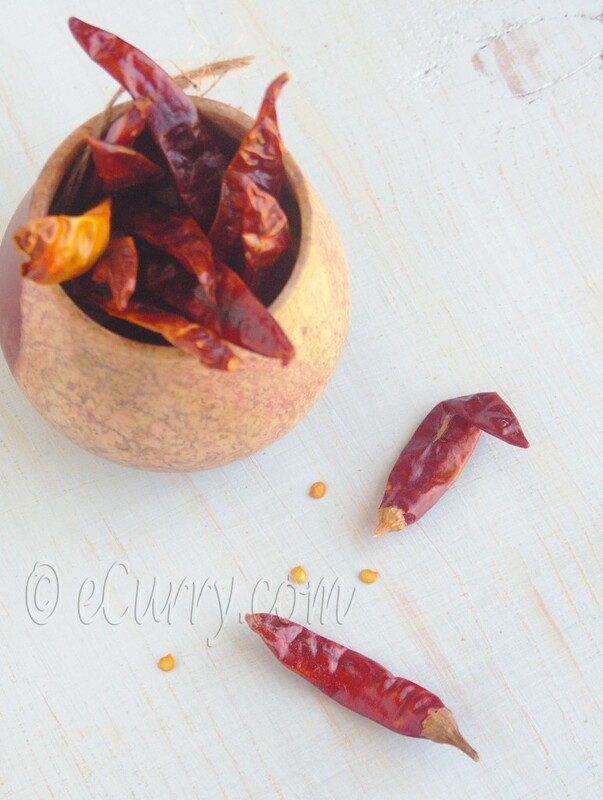 If you cannot get your hands on the Indian variety, feel free to use cayenne or paprika or even crushed red pepper. The color and the flavors will differ a bit, but they really can be substituted. However do keep in mind that the Chilli/Chile Powder is not the spice mix to make the Mexican Chili. This is the hot peppers dried up, esp. the cayenne pepper type. They have different flavor then the green hot peppers are are usually sizzled in oil and cooked up with the vegetables or meat. These dried peppers may be ground up to make Red Chili Powder. A salt with unique flavors. This is the common name for the mineral “halite”. Rock salt is a form of NaCl or the common table salt with some impurities in them. The slightly pungent smell in the salt comes from the presence of the sulphate. This salt is used as a final garnish by sprinkling on the fresh fruits and vegetables, salads and fried savories most of the time, though it is used during the cooking process in some dishes. The salt comes in the form of different hued crystals and are usually ground to a powder before used for culinary purposes. Do not forget that rock salt is used for making ice cream too! This is probably the most expensive spice. Looking like tiny orange threads, these are actually the stigmas of a flower called crocus. 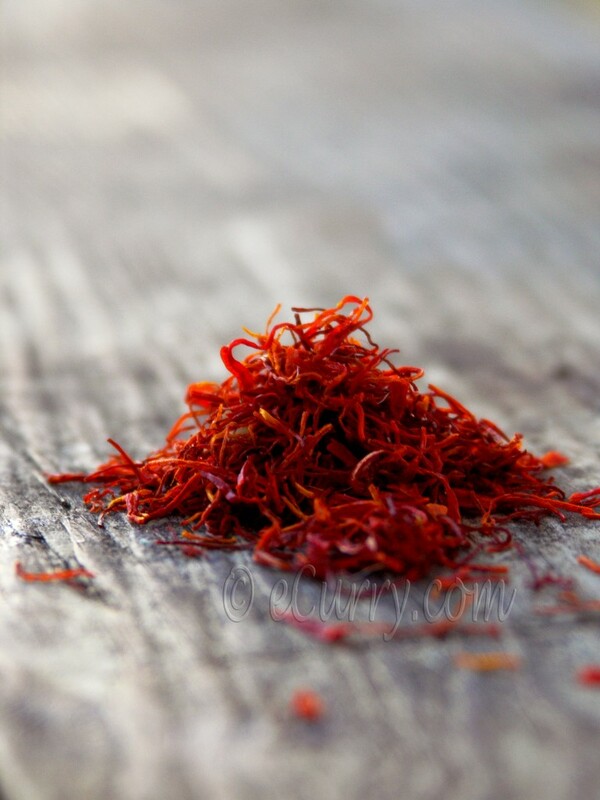 Saffron adds beautiful flavor and color to rice dishes, gravies and desserts. 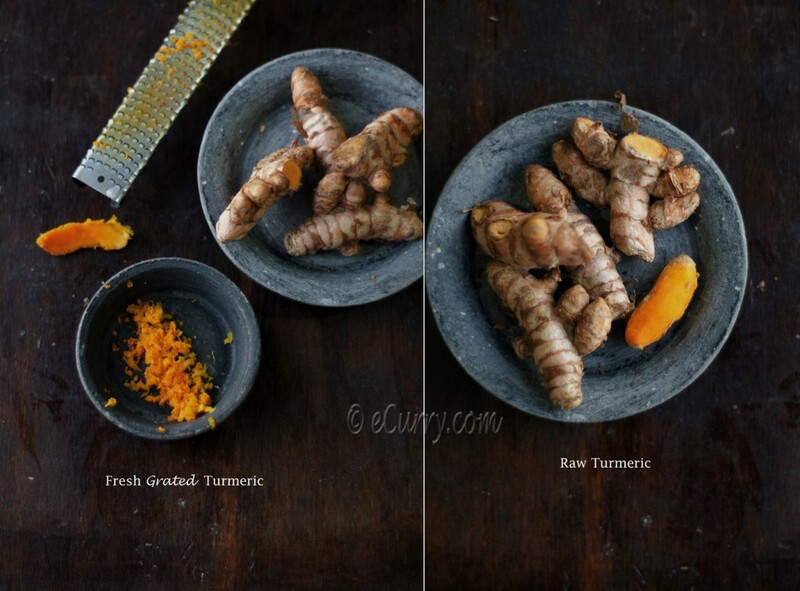 Turmeric is actually a ginger like rhizome in the raw state. The inside is deep orange yellow in color. The rhizome can be grated (fresh) and may be used in cooking. 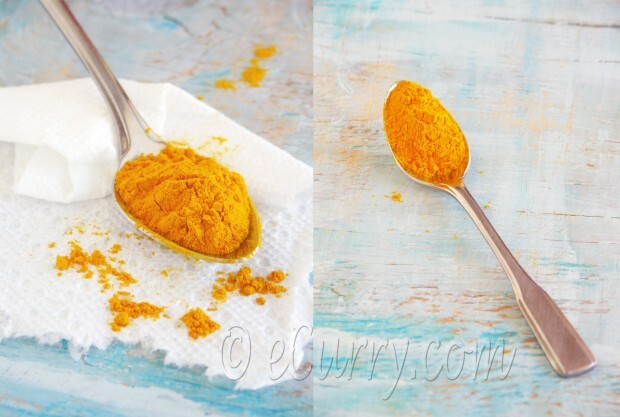 Raw turmeric is often times ground into a paste and used to improve skin and complexion. It also has very strong medicinal properties. However in for everyday cooking, the rhizome is dried and ground for the purpose of cooking. It gives the food a yellowish color. Turmeric is also known for its antiseptic qualities. Grocery stores usually sell the dried powdered form of turmeric. Do Not Forget the other Essentials! Chaat Masala: a mix of different spices in the powdered form. It is usually used in little amounts to flavor food after cooking; sprinkle on salads, and fried savories. It is easily available in the Indian grocery stores and there are many brands that sell this spice mix. Brilliant post, Soma!! 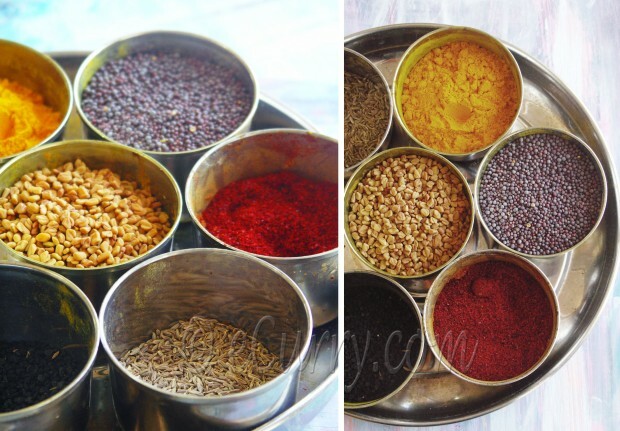 Great pictures and wonderful introduction to Indian spices! This is just wonderful information and again, such gorgeous pictures. See I learned quite a bit now by reading this. Thanks for such an informative post Soma!! Such a great breakdown of all those beautiful spices! I want them all! Now! WOW! 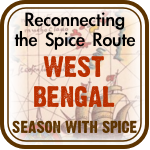 Absolutely fascinating info on Indian spices. I spent a month in India a few years ago, and have been in love with the food ever since. Thanks! there is nothing mentioning about black pepper….where can i get it from…??? The last picture: kesar is awwwwwwweeesommmmmeee!!!!!! Your pictures are inspiring me just too much. Jayifal/Jaiphal is same as nutmeg (I have it up in the post) and Javitri is Mace. Both are use mostly for savory dishes in India. In Pulao, Biryani, Meat and in some elegant regal vegetarian dishes too. This lesson in Indian spices and their names is very valuable. It really makes so many other recipes that I thought I could make and then realized were useless because I didn’t know what the ingredients were called in English. Please explain tempering when you get the opportunity. Thank you for your strong teaching skills and the very beautiful pictures. what is the our indian name of chia seed? I am not exactly sure, but I googled and I think what we use in India (not sure if it same as chia, but they are similar) is called “sabja” or they are kind of similar to Tukmaria. i do not know if you use it or not, but “amchur” or dried mango powder is also a staple in Indian kitchen, especially in Rajasthan. Just found your site. Thank you so much for putting it out there!! I love this page! I just linked and Pinned it on Pinterest, thanks for your generosities. hugs. Hey Soma, thank you so much for such a valuable guidance on basic Indian spices. I will look forward to learn more. Thanks! What a fabulous post this is. Indian cuisine is still a mystery to me, but I love it. which has a lot of medicinal value.Excellent colourful pictures. I just discovered your post and since I love curry will visit often. Thanks for those delicious recipes. i like this post very much . . .
it is very helpful for my studies . . .
Thanx for a kind work . . I am not sure what spice it could be. Clove is a flower but I already have it listed here, so I know it is not what you mean. The first thing that came to my mind is Dagad Phool used in Maharashtra. I have never used it, neither have seen it in real life. So it is not listed in the post. Look up Dagad Phool in Google images and see if it is what you are looking for. I hope I knew what it is and if you do find it, please let us know!! Star Anise (Illicium verum) probably? Gorgeous Gorgeous Gorgeous!!.. Cd keep reading the post over & over.. If the Western people on here don’t know what a spice is in English, just google it. There will almost always be a translation somewhere. Also, don’t be afraid to go beyond your comfort zone- it’s the only way to learn. The other is to actually eat, live and breathe Indian food- great way to learn. To Indiria- you are looking for star anise. You are probably talking about mace? 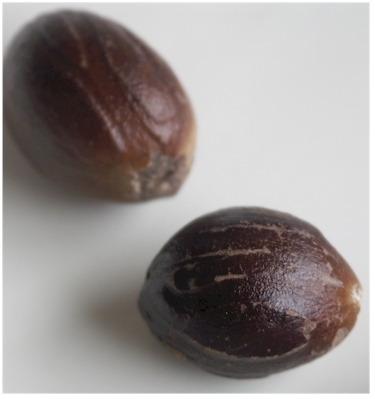 The outer covering of nutmeg. these are really nice pictures with high resolution, i wish that i will put these types of images on my websites, thanks for sharing these pictures. Living in South Africa we have the highest population of Indians outside of India cosequently we have Curry returants are all over Natal. I love curry and make a fair curry myself , having learnt from one of my Indian collegues. This website is fantatic and I definitely will try some of the spices I have never heard of. I wonder about the cinnamon sticks. When you say add the cinnamon, am I supposed to add the sticks whole or should I ground them? or just removed them at the time of serving? I am confused with this in the Butter Chicken recipe. some could tell/write the medicinal value of these herbs.Where could I find an article on the same. While using hing in lassi it should be roasted or raw? You would agree that hing is not sold in market in pure form but mixed with wheat flour to make granules. You can blend in the hing just by itself. If you want you can roast it too. Yes the hing sold in the market are not pure (the pure form is available in some places and will come in chunks not powder). 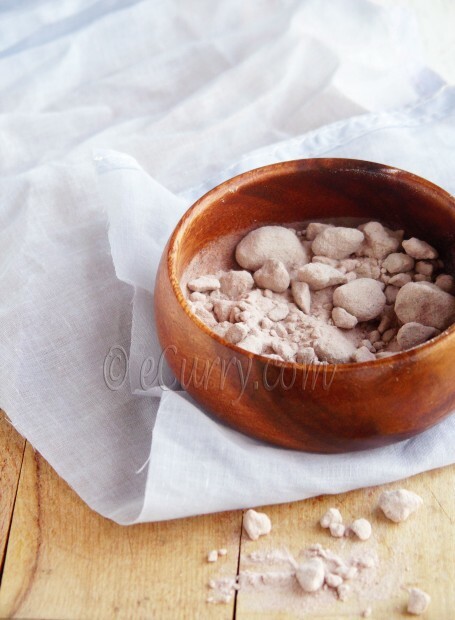 The powdered hing is mixed with wheat flour and hence much milder than the pure hing. Thanks for the wonderful information and superb pictures too..!! 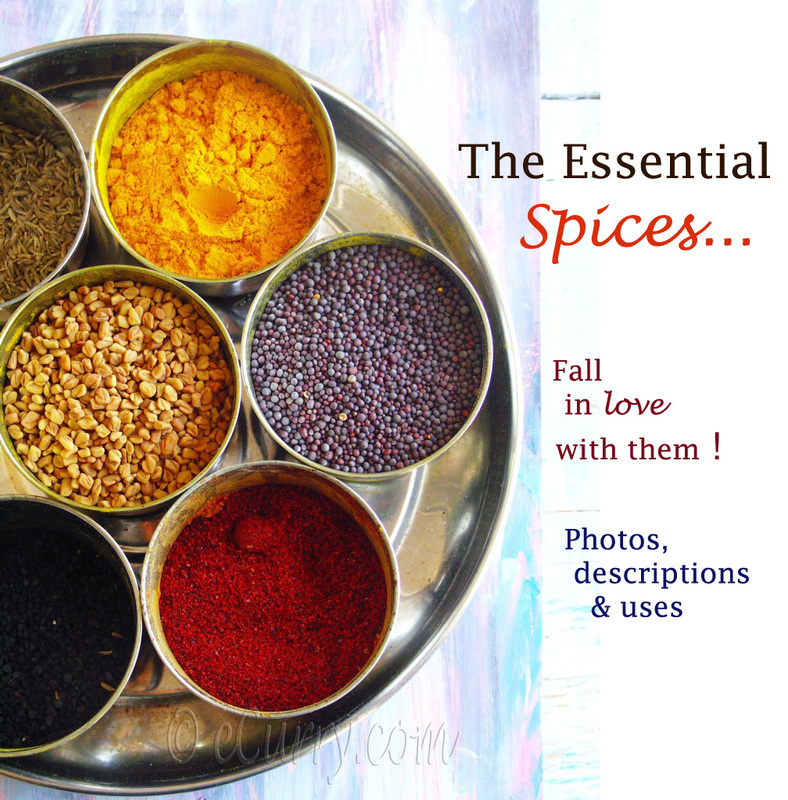 Nice blog for cooking,spices,food….read more…..share it….. Absolutely brilliant site for a beginner like myself keep it going love it. Just came upon your website and it is quite informative, beautiful pictures, an excellent source for the beginner like myself. Thank you so much for this information. I have just started cooking a few Indian dishes, so I am eager to learn about the different spices. My brother, who lives in Korea, is planning to visit the family here in Canada. He absolutely loves Indian cuisine, so I want to impress him. I am starting to think some of this spices are racing my Blood Presure, besides Ginkgo Biloba and anise seed that I know for sure raise it.I would love to know what is raising it. Hi, I’m looking for the name of a spice that is used in desserts. It is very sweet and aromatic smelling. My Iranian neighbor used to make cupcakes and they would smell wonderful! I live in an Indian neighborhood and smell this fragrance from cooking when passing by a house. Thank you. We use a lot of cardamom in desserts. Would you think that it is cardamom? I have the photos and descriptions of two kinds of cardamom in this list. The small green ones are usually used in desserts. The other one would be saffron. 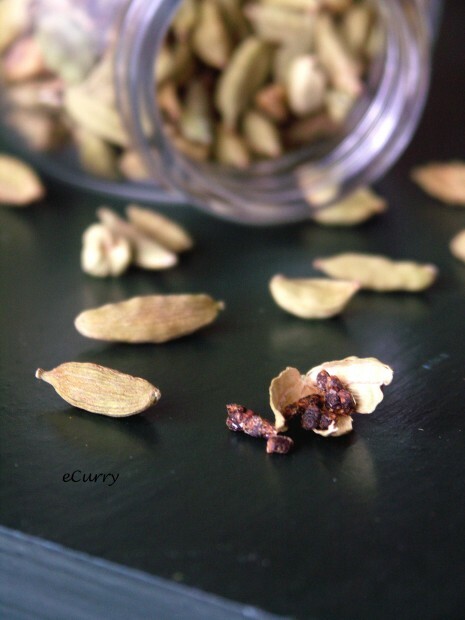 Cardamom is used in savory dishes too. Both the spices are used in Iran too. My brother has traveled extensively. His favourite food is Indian food. He said that he cannot look at a picture of Indian food without his mouth watering. I recently tried cooking Indian food; now I know why he feels this way. 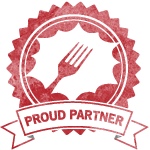 Nothing satisfies your taste buds like Indian cuisine does. Thank you for this information. what type/s of meat is used a lot in indian dishes and what type/s of meat isn’t used a lot or at all? It is usually chicken or goat meat (mutton as it is called in India). Some pork is used (but not my muslims, and Hindus do not eat beef (most). Such a wonderful and informative post… very useful for my son who is in the 9th Grade and has a project on Indian Spices in Home Science. Thanks a lot… God bless!!! I am so glad that this post came to use!! Thanks for the concise list!! Kindly help me are they same Walnut and Nutmeg? Can Nutmeg possible to eat fresh without cooking? where can i get methi seeds for planting in Kenya? Thank you for a detailed description of each spices mentioned above. I just wanted to point out that the kala jera and nigella are not the same things.These are two separate spices and may confuse your reader if not clarified. Nigella/Kalonji is called Kalo Jeera in Bengali. It is not “cumin” that I mean. . I have been living in Calabar, Nigeria for past couple of weeks and it is almost impossible to get indian spices here, so I decided to ask a friend who is traveling from Cape Town to bring some. This posting certainly helped me to gather required information to help me to guide her with what spices I wanted. Thank you so much for this..
Omg. Love Indian food. To expensive to go out and eat yummy food all the time. So I need to acquire some mad skills. Your lovely collection of Indian spices have been helpful and inspiring. Thank you so much! Made the garam masala and put it to use in two recipes so far. Smells so good :-D. So gonna try to make palak paneer for my next dish. Um question is chaat masala always used on saliads or is it also added to curry dishes. If so what dishes would it be used in? Also for red chilli powder is the tast quite close to paprika? Thank you for sharing with us .Using this information I am aware of all Indian spices.Indian spices are very popular for their fragrance and flavor..Nice one..!! Virtually all of whatever you articulate is supprisingly precise and that makes me ponder the reason why I had not looked at this with this light before. Your piece truly did switch the light on for me as far as this topic goes. Nevertheless at this time there is actually just one position I am not really too cozy with and whilst I try to reconcile that with the actual main theme of your issue, let me see what the rest of your readers have to say.Very well done. This was a wonderful post. Can you also list links to where these herbs could be purchased online as they are very difficult to purchase. Towards the beginning of the post I have listed a few websites from which the spices can be mail ordered. they’ll to open up all alternatives for them. thank you so much for ideas. I cant wait to try them. I have a Pakistani couple living next door to me and he dishes smell amazing. Thanks so much for the wonderful website you have created! I’ve been tryingt o make butter Chicken, and while the several recipes I have drawn influence from were good, and resulted in a flavorful meal, it really didn’t capture the flavor i remember. I have not tried your recipe yet, but the spices are /completely/ different from the other recipes i have tried. I have a question about “black cumin”. IT looks like the translation to English is loose, and you can come home with Bunium bulbocastanum or Nigella sativa. Both appear to be called several overlapping names, like Kala Jeera on places like Amazon. One looks a little like Caraway, and the other is called black caraway on Wikipedia but does not look like caraway at all. I have some of both, and they are nothing like each other. I’ll have to find some dishes that use them, but now I’m just getting more and more confused the more I research them. Wikipedia says little more than the latin name, and they they are different… it feels like Wikipedia is as weak as any of the other ambiguous references. Regarding the Kala Jeera. You are right that there are at least two that is loosely called by the same name. 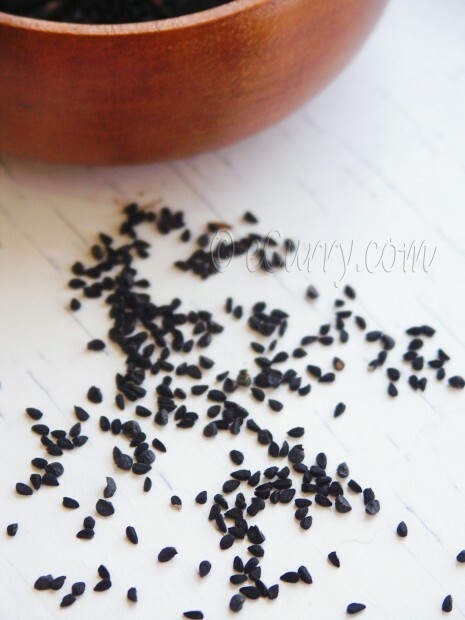 The Nigella Sativa, which is slightly teardrop shaped and very dark/black are called Kalo or Kala Jeera in Bengali. In stores it also goes by the name Kalonji. Some call it onion seeds but that name probably came from the flavors as it would seem similar to onion powder in the first whiff.. This spice is very widely used in Bengali cuisine. In the rest of the Indian cuisine the use is limited but a lot of Indian pickle recipes use this Kalonji. 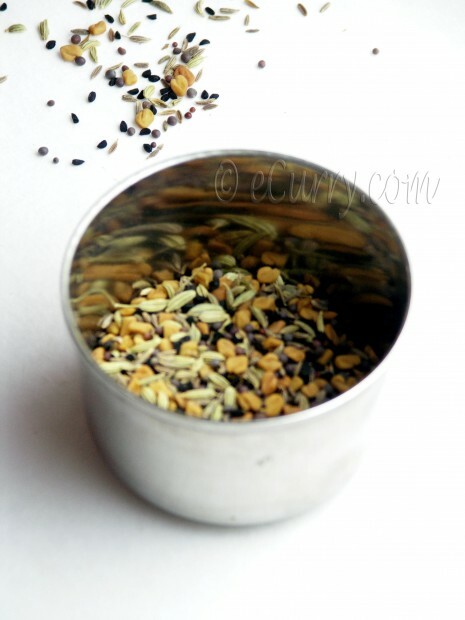 This one is one of the ingredients of the Indian Five Spice Mix or Panch Phoron. The other one which looks like caraway has very different flavors. Personally I rarely use this one. But I know it is used for some recipes. I have the kalonji listed in this list I have with the photo. The blog has quite a few recipes using this. Let me know if yo need to find them. your site? Its very well written; I love whhat youve got to say. Barbara Nupp, people use turmeric instead of saffron, for the colour. It won’t simulate the flavour though.